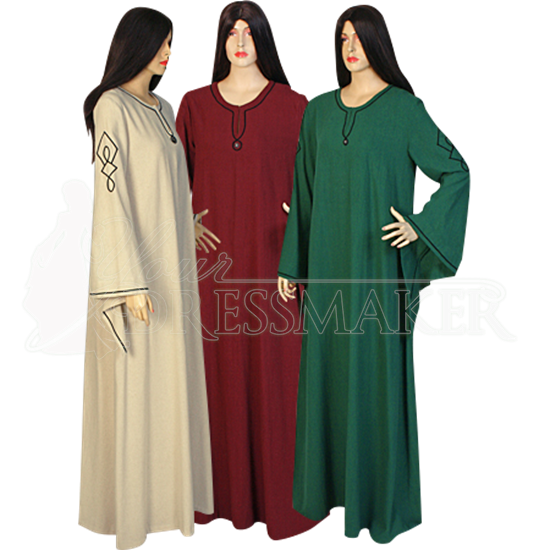 While a chemise is typically considered to be something of an under-garment, the Wide Sleeved Norse Chemise is really more of a versatile, multi-purpose article of clothing that can be used to fill a variety of roles beyond the typical norm. This simple yet attractive chemise is made entirely from natural cotton and comes in a wide variety of colors, all of which feature delicate trim around the neckline. The fabric used in the garment lends it an incredibly rustic look and feel, while also affording the garment comfort and ease of care. The chemise has full-length, loose-fitting sleeves that end in wide-brimmed, elegantly draped cuffs that hang off the wrist. The cuffs echo the delicate trim from the collar, while the arms are decorated with a simple geometric pattern. At the edge of the collar, a single medieval-styled medallion decorates the breast of the chemise. Long in length, this chemise is designed to reach the ankles. This chemise has an A-line design and sports a very loose, flowing fit. This Wide Sleeved Norse Chemise is such a simple and elegant item that it can be worn on its own or paired with any number of other garments. It can be worn under dresses, with skirts and bodices, or with any other style of garment you choose, in order to create a number of medieval, fantasy, and perhaps even contemporary styles. The material is very nice and good quality. The design and trim is exactly as shown on the web site. I ordered it to use as a costume for a book signing and plan to join SCA when I retire and it will be perfect for that.